In a town known for hangovers, the Tigers showed some strong recovery powers in beating Larry Bird's alma mater tonight in the consolation game of the Las Vegas Invitational. In spite of the game tipping off merely 18 hours after a drubbing at the hands of Baylor, Memphis surged over the latter 10 minutes of the first half, outscoring the Sycamores, 29-5, to take control of a game they'd lead the rest of the way. Indiana State took an early 17-11 lead, but the Tigers tied things at 17 on a dunk by Shaq Goodwin with 8:53 to play before halftime. Back-to-back three pointers by guard Avery Woodson closed the first-half scoring at 40-22, Tigers. The U of M extended the lead to 20 (46-26) before going cold in the second half. The Sycamores closed within seven points (56-49) on a three-pointer by center Jake Kitchell with 2:19 left to play. But Kitchell fouled out 20 seconds later and the Tigers hit their free throws down the stretch, outscoring Indiana State 10-8 over the game's final minute to even their record at 2-2. The Tigers shot 46 percent from the field and limited the Sycamores to 33 percent. Goodwin led Memphis in the scoring column with a season-high 19 points. Trahson Burrell came off the bench to score 15 and was joined by Woodson (12), Nick King (11), and Austin Nichols (10) in double figures. Brenton Scott led Indiana State with 12 off the bench. The Tigers will play their next nine games at FedExForum, starting next Tuesday when they host Stephen F. Austin. They won't play another road game until they visit SMU on January 8, 2015. In a game that began late Thursday night and ended early this morning, the Tigers fell to Baylor in the semifinals of the Las Vegas Invitational. The U of M played well Thursday night (at least in the central time zone), taking a 32-29 lead over the Bears into halftime. But after midnight . . . all pumpkin. Baylor outscored the Tigers 42-15 over the game's final 20 minutes to improve to 5-0 on the season. Memphis dropped to 1-2 and will face Indiana State in tonight's consolation game. The Tigers shot poorly (34 percent from the field, including a dreadful 4-for-21 in the second half) and again had trouble distributing the ball (eight assists against 14 turnovers). Baylor commanded the glass, too, pulling down 43 rebounds to the Tigers' 32. 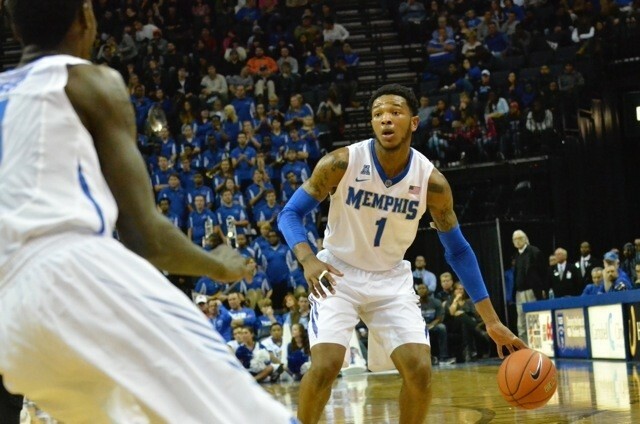 Pookie Powell led Memphis with 13 points off the bench but was the only Tiger in double digits. Shaq Goodwin (1 for 6) and Austin Nichols (3 for 10) never found a rhythm on offense. Goodwin again came off the bench but contributed only two points and four rebounds in 24 minutes. The most encouraging figure for the Tigers was their 40-percent mark from three point range (6 for 15). Powell, Avery Woodson, and Markel Crawford each hit two from long distance. The U of M has not started a season 1-3 since the 2000-01 season, John Calipari's first as head coach at Memphis. The Tigers won their 12th straight home opener tonight, easily handling Prairie View A&M in front of a relatively sparse FedExForum crowd. (If there were 14,412 fans in attendance, as announced, many of them spent the entire game at concession stands.) The Panthers scored the first field goal of the game before falling behind 15-2. With less than 12 minutes played, Memphis had a 26-11 lead and room to experiment with a rotation still to be determined in the young season. With a 22-6 edge on the boards, the Tigers led 38-23 at halftime, shooting proficiently from the field (60 percent) and the free-throw line (85 percent). By game's end, those percentages had dropped to 50 and 75, respectively, but the U of M (1-1) had secured its first win of the season and sent the Panthers to their fifth loss in five games. Shaq Goodwin led the Tigers with 16 points in 23 minutes, hitting all six of his shots from the field. Junior forward Trahson Burrell contributed 9 points and 9 rebounds. They were two of nine Tigers to play between 16 and 28 minutes as coach Josh Pastner explores the strengths (and discovers the frailties) of a team still getting to know one another. Freshman Markel Crawford and sophomore Avery Woodson started in the backcourt and each drained a pair of three-pointers, Crawford finishing with 9 points in 20 minutes and Woodson with 8 in 18. After a horrid 4-assist, 24-turnover showing in their opener last week against Wichita State, the Tigers dished out 15 assists tonight against 16 turnovers. There was a common word mentioned by players after the game, an ingredient that can only be found through winning basketball games. "It feels good to finally get a win with this new team," said Goodwin. "To see [Crawford and Woodson] have the confidence to keep shooting was amazing. That means a lot to this team. Hopefully it will bring up their confidence, they'll keep shooting, and we'll be fine." Added Crawford, "Confidence has probably been the biggest issue, only because we've been thinking too much. We have to play through the post, and seeing our big men do the job boosts our confidence." Sophomore forward Austin Nichols had 7 points and 3 blocks in 16 minutes. "It's nerves," said Woodson, when asked about the confidence factor. "We're trying to form a team. We have individual talent, but we need to get more games under our belt and get a good feel for each other. We all have to be productive for us to be a great team. For some of us, it's our first time playing at this level. It's a matter of being comfortable out there." With a confidence-boosting first win under their belt, the Tigers will head to Las Vegas, where they'll face Baylor Thanksgiving night (tip-off at 11 p.m.) in the first of two games in 24 hours. Tiger coach Justin Fuente calls it a weekly "quest to go 1-0." 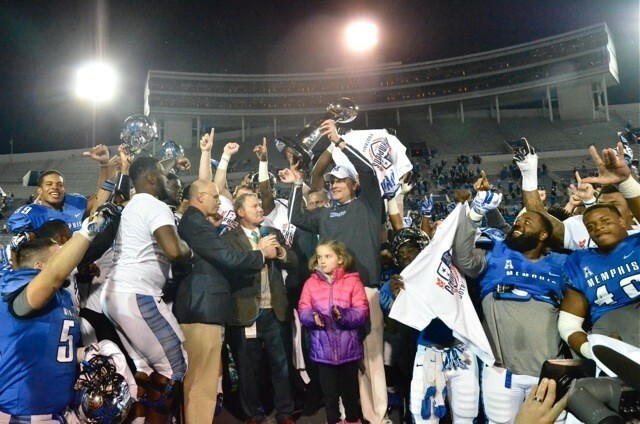 With their win today over the South Florida Bulls at the Liberty Bowl (in front of 34,635 fans), Fuente's Tigers have fulfilled that quest five weeks in a row, earning the Memphis program eight wins for the first time since DeAngelo Williams's junior campaign of 2004. It's the program's first five-game winning streak since Williams was a sophomore. After spotting the Bulls an early 3-0 lead, the Tigers scored on consecutive first-quarter possessions, quarterback Paxton Lynch running the ball into the end zone to culminate each drive. 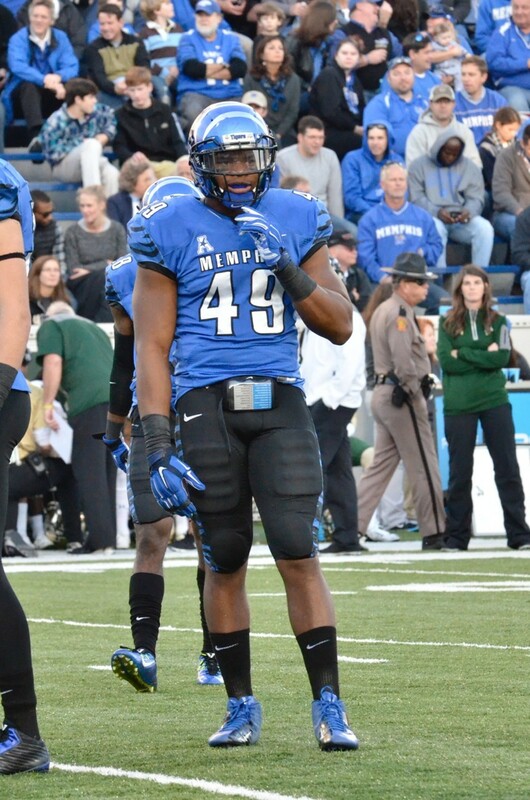 (Lynch's 10 rushing touchdowns this season ties a Memphis record for quarterbacks set in 1961 by James Earl Wright.) In addition to the two touchdowns on the ground, Lynch passed for a pair, a 42-yarder to Mose Frazier in the second quarter and an 11-yard toss to senior tailback Brandon Hayes in the third. This was the sixth game of the season Lynch has both run and passed for touchdowns. Hayes rushed for 189 yards on 21 carries, the second-highest total of his career. Down 28-13 midway through the third quarter, USF drove the ball inside the Tigers' 20-yard line, only to turn the ball over on a fumble forced by sophomore linebacker Jackson Dillon. It was the last time the Bulls threatened before scoring in garbage time. The victory improves the Tigers' record to 8-3 and secures a tie atop the American Athletic Conference with a league record of 6-1. Memphis will clinch at least a tie for the AAC championship with a win next Saturday against Connecticut. "There's no superstar on either side of the ball," said Fuente after the game when asked how the 2014 Tigers will be defined. "This group is selfless, and they're very good listeners. That's an important trait." Among the faces of the team will be senior defensive end Martin Ifedi. With the game in hand, Ifedi broke through the USF line in the fourth quarter to sack USF quarterback Mike White. 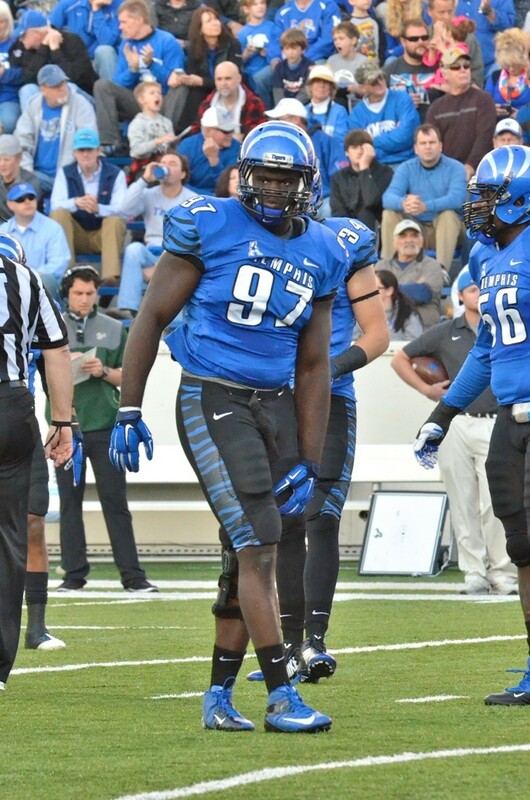 The tackle gives Ifedi 22.5 sacks for his career and places him alone atop that chart in the Memphis record book. "It's a great feeling," said Ifedi. "[My teammates] knew how much this meant to me. We've joked around since the offseason. I was kind of afraid we'd get a penalty for excessive celebration." The sack was but one of eight tackles-for-loss accumulated by the Tiger defense, which still allowed 396 yards for the game. (The Tigers gained 470 on 19 fewer plays.) Senior linebacker Tank Jakes contributed eight solo tackles. Lynch completed 18 of 23 passes for 232 yards and didn't throw an interception for the fifth straight game. "The past two weeks, Mose has managed to slip by the defense and I've been able to find him," said Lynch. "We're gonna enjoy this tonight, but tomorrow we'll get right back to work. UConn got us pretty good last year. With one home game left in his college career, Ifedi smiled when asked to reflect on the growth he's seen since the Tigers went 2-10 his freshman season (2011). "The young guys know what it takes now. We have great coaches who came in and showed us the vision. We implemented the plan in the offseason, and were consistent [with our work] in the offseason. [Coach Fuente] doesn't tolerate certain things. We understand what he wants. We play hard on the field for each other." The Tigers return to the Liberty Bowl next Saturday to host the Huskies on Senior Day. Kickoff is scheduled for 3 p.m. The Tigers confirmed some early-season worries this afternoon in their season-opener in Sioux Falls, South Dakota. Facing the 11th-ranked Wichita State Shockers (a team that didn't lose last season until the NCAA tournament), Memphis trailed throughout, shot the ball woefully, and suffered poor guard play from a collection of rookies that combined for two assists and 13 turnovers in 40 minutes of basketball. (Tiger forwards combined for 11 more turnovers. And two assists.) Final score: Wichita State 71, Memphis 56. Ron Baker led the Shockers with 21 points, while Fred VanVleet added 15 and Darius Carter 12. Nick King paced the Tigers with 16 points while Austin Nichols and Avery Woodson (one of those rookie guards) added 10 each. The loss is the first to open a Tiger season since the 2003-04 campaign, though it came against the highest-ranked opening opponent since Memphis faced 8th-ranked Louisville to start the 1975-76 season. Both teams shot like it was their first game of the season, the Tigers missing ten of their first twelve attempts from the field and the Shockers not separating until the final minute of the first half when the Wichita State lead was stretched to seven (29-22). The Shockers pulled away over a two-minute stretch early in the second half, extending a 35-29 lead to 44-29 on a jump shot by Tekele Cotton. Memphis shot 40 percent from the field and missed seven of nine attempts from three-point range. King led the Tigers with seven rebounds and Nichols blocked six shots. Limited by foul trouble, junior forward Shaq Goodwin was held to four points and six rebounds. The Tigers return to FedExForum next Monday night when they'll host Prairie View A & M at 7 p.m. The Tigers capitalized on a turnover-prone Tulane squad to win their fourth straight game and retain a hold on first place in the American Athletic Conference. The winning streak is the program's longest since 2003. With an overall record now of 7-3, Memphis has clinched its first winning season since going 7-6 in 2007. 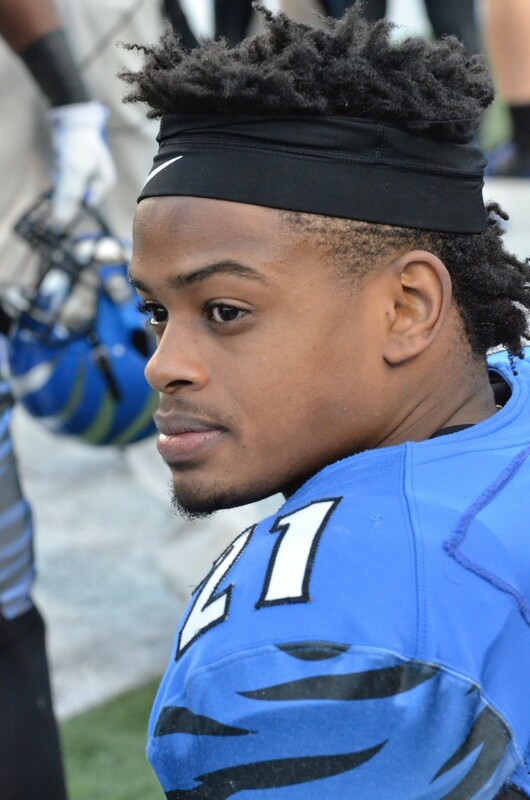 Memphis scored the only ten points of the first half, the first touchdown coming on a 15-yard interception return by senior cornerback Bobby McCain just 1:55 into the game (the 11th pick of McCain's career). Sophomore kicker Jake Elliott connected on a 22-yard field goal in the second quarter, a rare highlight in a half that featured a total of nine punts, four turnovers, and two missed field goals. The Tigers extended the lead to 17-0 a little over five minutes into the second half on a 38-yard pass from Paxton Lynch to Mose Frazier. Lynch later scored on a four-yard run, his eighth rushing touchdown of the season. This was the fifth game of the season Lynch has both passed and run for touchdowns. A week after upsetting Houston, Tulane (3-7) turned the ball over five times. Sophomore cornerback Dontrell Nelson picked off a Tanner Lee pass late in the third quarter and returned it 58 yards for a touchdown. Those turnovers were the difference in a game that the Green Wave offense actually outgained the Tigers (351 yards to 334). 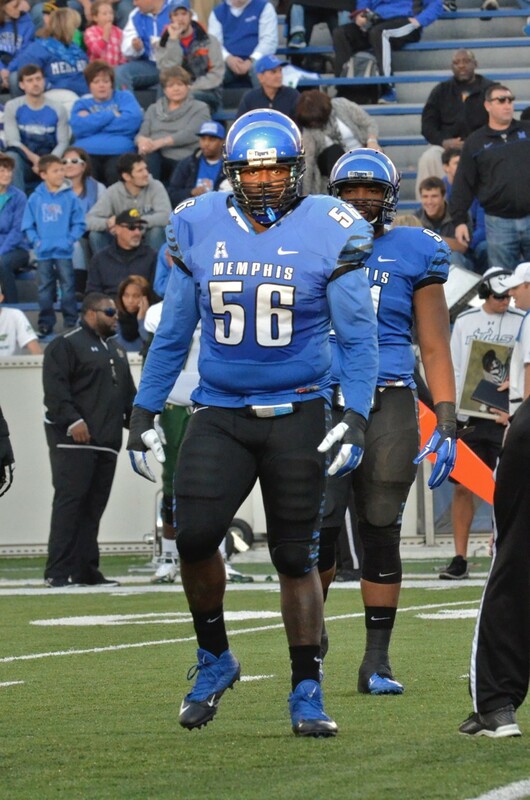 Brandon Hayes and Robert Davis led Memphis on the ground with merely 47 yards each. (Davis scored the game's final touchdown with just over a minute to play.) 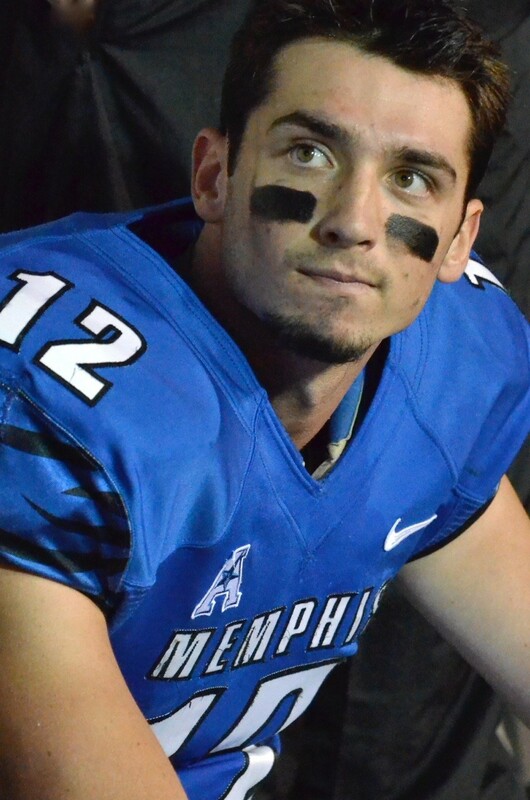 Lynch completed 14 of 25 passes for 178 yards and moved into third place on the Memphis career passing-yardage chart (behind Danny Wimprine and Martin Hankins). I'll resist snark. It's too easy tonight. The Tigers lost their first exhibition game in 18 years (not since Larry Finch's last as head coach at his alma mater). For Trey Casey, Ryan Fleming and the rest of the CBU Buccaneers, it's a game they'll recall for grandchildren 30 and 40 years from now. The only silver lining for the U of M: No matter what happens the rest of the 2014-15 season, the Tigers' most embarrassing loss is behind them. Wondering if Tiger sophomore Kuran Iverson might have made a difference in the overtime loss? Memphis coach Josh Pastner described the forward's not playing as "coach's decision." Perhaps a lesson was taught before the games count in the standings. Plenty of other lessons were, at the least, introduced tonight. Here are four big-picture thoughts as the season-opener against (gulp) Wichita State next Tuesday approaches. 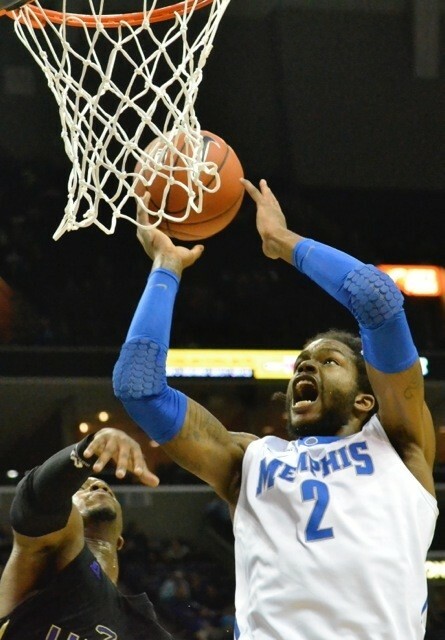 • The Tiger backcourt is a time-share, and I'm not convinced Pastner knows any more than we do about the production he'll receive this season. Pookie Powell played so poorly in the first half, he was given but two minutes of playing time in the second. Pastner described Vanderbilt transfer Kedren Johnson as "not good, whatsoever" after the game. Johnson had six turnovers, including a critical one with the game tied and 14 seconds left in regulation. Avery Woodson played 30 minutes, part of a seven-man rotation in the second half. But he missed eight of 11 shots (six of eight from three-point range). There were a lot of slings and arrows aimed at the four senior guards that shaped last season's squad. With this year's team, there may be a new target for criticism, one game to the next. • This team is in dreadful need of a shooter. And Pastner knows it. ("There's a question mark with our shooting," he said after the game.) They will not win games from the perimeter, meaning they have to feed the ball to forwards Shaq Goodwin and Austin Nichols, which furthermore means they have to push the ball up the floor . . . prevent defenses from collapsing around the Tiger twin towers. "In my six years as coach here," said Pastner, "this was the slowest pace we've ever played." Here's where we have to watch how Pastner coaches, how he teaches. Shooting can't be taught once a player reaches college. (Fine-tuned, yes. But shooting can't be learned when you're 18 or 20 years old.) But Pastner can teach his guards how to play faster, to pressure defenses with ball movement, and feed the big men before defenders have established position. • Nichols is supremely talented, but I think Goodwin will be the pulse of this team. He has the chance to be a version of Hall of Fame-bound Kevin Garnett, the rare forward who can will his teammates to wins through emotional impact. Goodwin has to play with fire; this much is a given. There's not enough talent around him for anything less. But he must also show the fire. There was a stretch tonight — midway through the second half — when Goodwin hit a pair of baskets (one an alley-oop dunk on a feed from Nichols) and captured the FedExForum crowd. The Tigers went up 50-43 with 8:35 to play and seemed to have the game (finally) in hand. Then he (and his teammates) faded. An entire season remains to be played. You'd like to say the Tigers can start from scratch in South Dakota next week. It just doesn't feel that way. 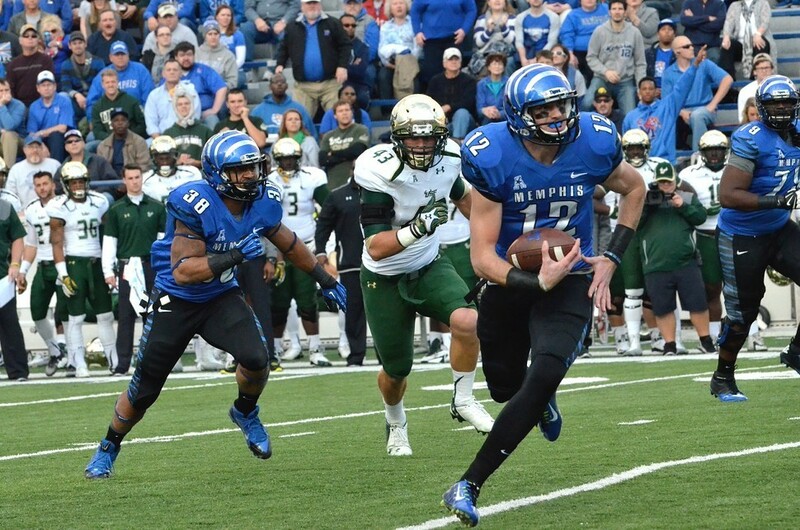 For the first time in six long years, the Memphis Tigers are bowl-bound. When Jake Elliott's 31-yard field goal attempt just cleared the left upright as time expired tonight in Philadelphia, the U of M secured its sixth win of the season and retained a portion of first place in the American Athletic Conference. Better yet, the Tigers avenged perhaps the ugliest defeat in coach Justin Fuente's three years at the helm, a 41-20 loss to Temple last November at the Liberty Bowl. With the exception of a 75-yard touchdown run by the Owls' Kenny Harper late in the first quarter — a score that gave Temple an early 10-0 lead — the Memphis defense contained an offense commanded by dual-threat quarterback P.J. Walker. Several Walker passes hit targets, only to be dropped or deflected (one of them intercepted by Tiger cornerback Andrew Gaines in the second quarter, deep in Memphis territory). The Tigers held Temple to 308 total yards (4.4 yards per play), enough for them to win their first game of the season without gaining 200 yards on the ground (81). The Tigers also protected the ball against an Owl defense that forced seven turnovers in an upset last Saturday of East Carolina. 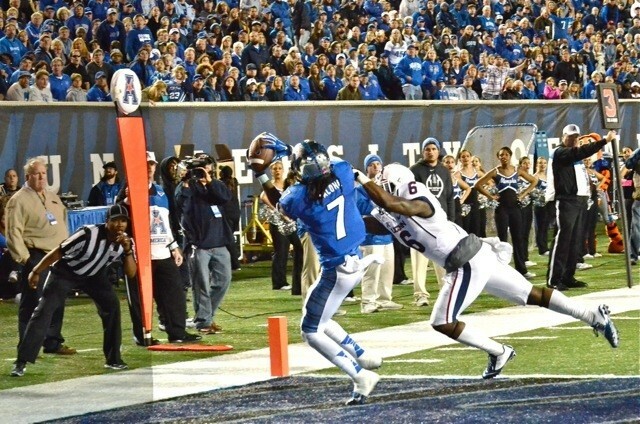 The only Memphis miscue came on a Temple punt that deflected off B.J. Ross before being recovered by the Owls. Temple was unable to score despite taking over at the Tigers' 25-yard line. The Tigers' lone touchdown came shortly after a shanked punt by Temple's Alex Starzyk. From the Temple 41, Lynch completed a 24-yard pass to Frazier, then a 17-yarder to Hayes who entered the right corner of the end zone untouched to tie the game at 10 with just under four minutes to play before halftime. After the break, the teams combined for eight punts and three field goals, the Tigers' game-winning drive the only steady display of offense. 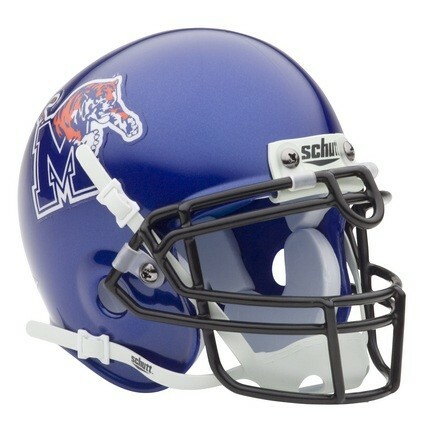 Now 6-3 (4-1 in American play), Memphis has a chance to make a good season rather special. The Tigers' three remaining games are against AAC bottom-feeders Tulane (next Saturday in New Orleans), USF (November 22nd at the Liberty Bowl) and UConn (November 29th at the Liberty Bowl). Two more wins would give the program just its fifth 8-win season in more than 50 years. 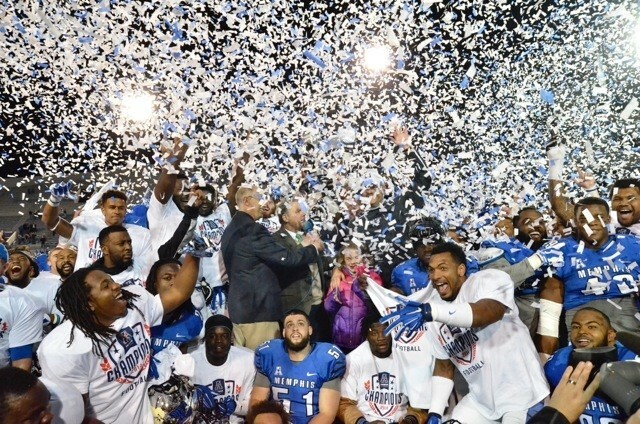 Memphis also remains in the hunt for the American championship, currently a five-team race alongside ECU, UCF, Houston, and Cincinnati. For now, there's plenty to celebrate in merely gaining bowl eligibility. One year after finishing 3-9, three years after finishing 2-10, the University of Memphis is riding a three-game winning streak toward postseason football. Wait 'til this year, indeed.